Spigarello, a broccoli cousin, could be your new go-to green. It’s crisp, sweet and lasts a few days in the refrigerator. ALBUQUERQUE, N.M. — It’s hard to say where Marjory Sweet looks happier. Is it in the field when she bends down to uncover a row of budding spigarello or in her kitchen where she casually tends the sauté pan? The answer seems to be that both locations give her equally deep pleasure because for Sweet, the two activities are as divinely connected as are the deep flavors and pure nutrients of the food she grows, sells and cooks. The field manager of Chispas Farm in Albuquerque’s South Valley, Sweet has been working with Eli and Amanda Burgione who have farmed this four-acre parcel for 12 years. John Sparks owns the land, which sits at the southern edge of Albuquerque, and hardworking farmers, namely the Burgiones and Sweet, have faithfully kept it in agricultural production. 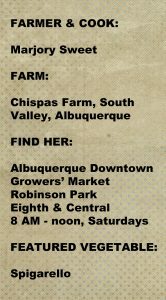 Regular shoppers at the Downtown Albuquerque Growers’ Market may know Chispas Farm for its extensive selection of garlic, as the Burgiones have been known to grow more than 100 varieties for seed saving. The land at Chispas still yields stellar garlic, but now that Sweet is in charge of planting, she is experimenting with some new crops like spigarello. “What I grow on the farm ends up in my kitchen, and my kitchen provides inspiration for what I choose to grow. I fell in love with spigarello when I tasted it a few years ago at one of my favorite restaurants in Brooklyn,” Sweet says. So what exactly is spigarello? Maybe you haven’t yet been introduced to this tender green that is part of the broccoli family. 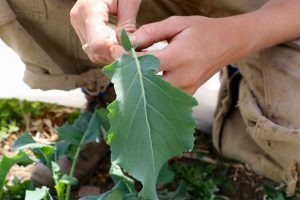 The name spigarello is a slightly Americanized version of the plant’s given name “spigariello,” an heirloom variety native to southern Italy that is considered to be the parent of broccoli rabe. While spigarello is just making it debut in New Mexico, it seems to be getting trendy in southern California restaurants, and apparently where Sweet found it, in New York. Sweet’s spring crop of spigarello appeared at the Downtown Growers’ Market in mid-April and she expects it to go strong until sometime in June. She will have another yield available in fall as it is fundamentally a cool-weather crop that can handle some frost. Sometimes unfamiliar vegetables take some getting use to. Not so with spigarello. Sweet says that everyone who stops by her market table and takes one bite of the raw leaf is an immediate fan. Spigariello is native to southern Italy and is considered to be the parent of broccoli rabe. “If you like any green vegetable, you will like it,” Sweet says. It also comes with the advantage of holding up well and can easily last 10 days in the refrigerator. But its versatility and flavor is the thing that will keep you coming back for more. Watching Sweet cook, two things became abundantly clear: simple cooking techniques go a long way toward producing delicious results, and spigarello may become your next go-to green. Check out Sweet’s recipes. They each highlight the slightly grassy spigarello with complementary flavors. From the brightness of lemon paired with Parmigiano-Reggiano, to the saltiness of anchovies, to the nutty, creaminess of a yogurt-shallot dressing combined with toasted pistachios, it’s hard to go wrong. And if you’re a fan of pesto, consider whipping up a quick batch of spigarello pesto that is supercharged with vitamin C and many more nutrients beyond those found in traditional basil pesto. What else can you do with spigarello? 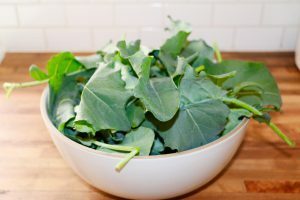 Sweet advises choosing any of your favorite kale or spinach recipes and simply replacing them with spigarello. It has taken Sweet three years to perfect the growing of this new crop. The first season she planted in late fall. The next year she seeded the plants a bit too close together. This year, everything went just right and the plants were right on schedule for the spring season. Margery Sweet, field manager at the South Valley Chispas farm, pauses between rows of spigarello. Just as her spigarello has taken to the well-tended soil at Chispas, so too has Sweet adapted to New Mexico, putting down her own roots just a few miles from Chispas in the Riverside neighborhood of the South Valley. Coming from Maine, Sweet arrived in Albuquerque five years ago knowing only that she wanted to work outside. She had no experience farming, but after she met the Burgiones, she convinced them to let her become an apprentice at Chispas and spent her first intense year working hard and learning everything she could. “Eli and Amanda are amazing teachers in the field and they took my apprenticeship seriously. Ultimately, they taught me that good farming is based on healthy soil. Eli always reminds me that we are actually growing soil on the farm, the vegetables are just secondary,” she says. Sweet, in fact, has been was such a good student that not only has she taken on the work of managing Chispas Farm, but also she tends a mini-farm in her own backyard. Out her back door are chickens, Nigerian dwarf goats and champagne d’argent rabbits, which provide her eggs, milk and meat. She learned to butcher with guidance from a older farmer. “I believe in stewardship, and thought that if I was taking so much care with the vegetables that I ate, I should do the same with other foods,” she explains. 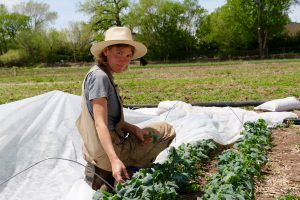 Sweet, 29, says she loves the regular solitude farming provides, but also relishes Saturdays at market for nourishing conversations with customers and friends. 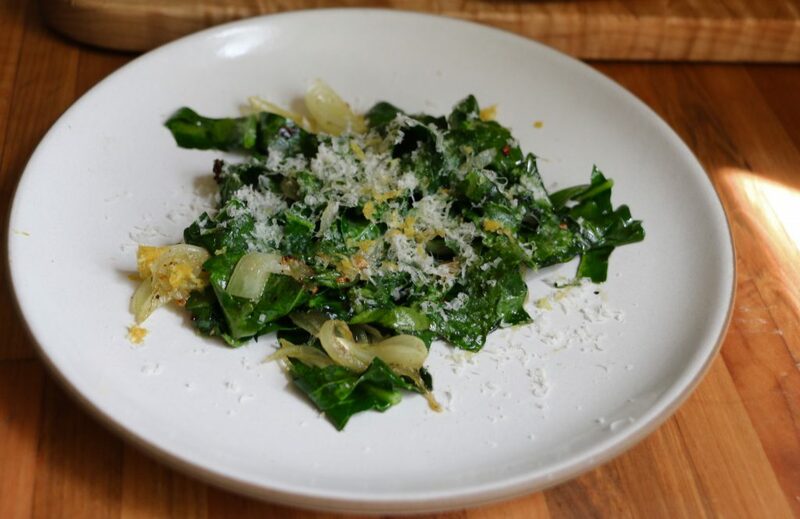 Sautéed spigarello with chile, green garlic, lemon zest, and Parmigiano Reggiano. Chop spigarello (including stems) crosswise into ½-inch in strips. Finely chop green garlic. Heat 2 tablespoons olive oil in a skillet, when shimmering add green garlic. Sauté until golden, do not brown. Add chile flakes and ground pepper. Add spigarello and sauté until bright green and glossy. It does not need long in the pan. Off the heat, add half the lemon zest and half the finely grated cheese. Toss. Top with remaining zest and cheese. Serve with toast, crispy fried egg or both. Roughly chop spigarello, including stems. Place butter in a small skillet over medium low heat until it melts and begins to brown. It should become fragrant and nutty. At this point, remove the skillet from the burner to avoid burning it. Set aside. In another skillet, heat olive oil until shimmering. Add greens and parsley. Sauté until just wilted. Add black pepper, preserved lemon, lemon juice. Stir to combine well. Add half the brown butter, including the crispy brown bits. Heap the greens mixture onto toast. Top each with one white anchovy. Spoon the remaining brown butter over the top. Serve. 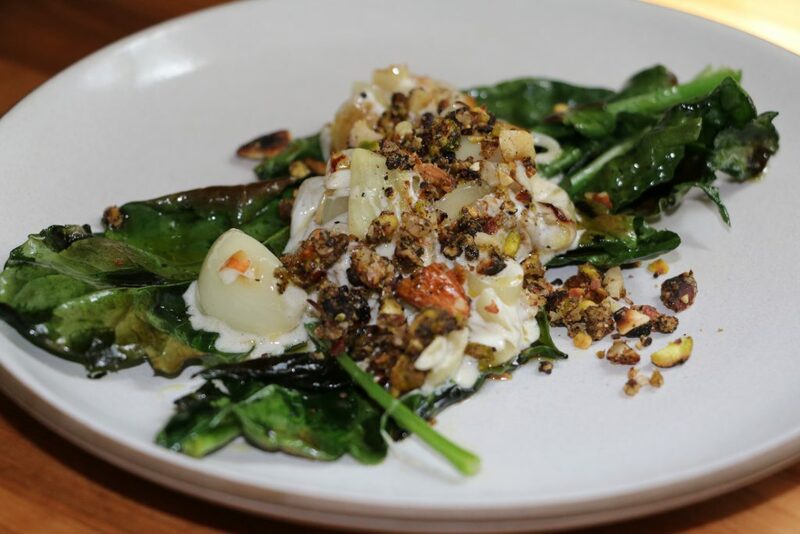 Grilled whole-leaf spigarello with shallot-yogurt dressing and toasted pistachios. Heat 2 tablespoons olive oil over medium heat in a skillet. Add shallots and cook until golden brown and fragrant. Remove from heat and set aside. In a dry skillet over medium heat, toast almonds and pistachios until fragrant. Set aside and when slightly cooled, chop or pulverize to a coarse grind in a food processor. Meanwhile, heat a grill pan over medium. Toss the spigarello leaves (whole, with stems) in 2 tablespoons olive oil and place on the hot grill. When they are bright green and charred in spots remove and set aside. At this point, the shallots should be slightly cooled. Mix the shallots with the yogurt, black pepper and salt. 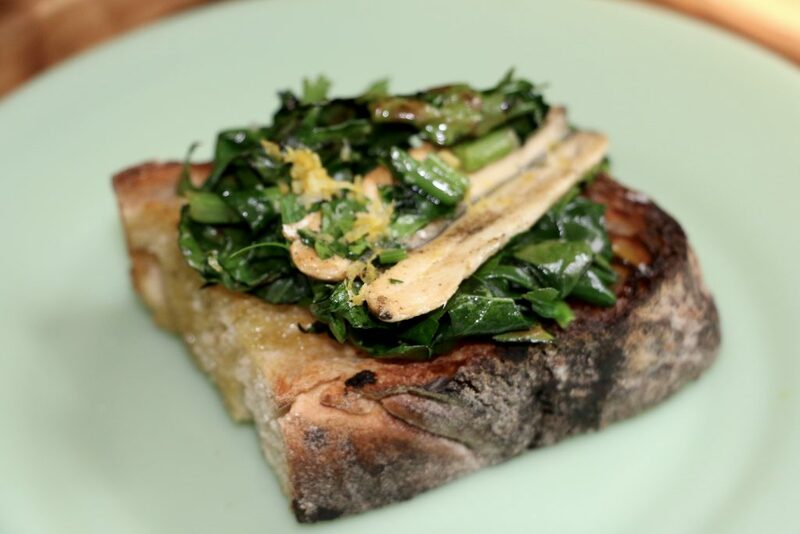 Arrange the grilled spigarello on a plate. Top with the yogurt dressing and sprinkle with the toasted nut mixture. Drizzle with a bit more oil if desired. Particularly good when served alongside simply grilled meats. Bring a pot of salted water to a boil. Prepare an ice bath in another bowl, preferably metal, with cold water and ice cubes. When the water is at a rolling boil add all of the spigarello at once. Make sure all of the greens are submerged. Cook for 2 minutes or until completely wilted and bright green. Remove from the boiling water and immediately plunge into the ice bath to set the color and stop the cooking. When cooled, drain in a colander and set aside. If needed, wring it out in a clean tea towel. Meanwhile, heat 2 tablespoons oil over medium heat. Add green garlic and pistachios. Cook, stirring, until the garlic is golden brown and the nuts are toasted. Transfer to a bowl and add lemon zest and black pepper. Let cool. Combine the spigarello – now cooled and drained of water as much as possible – and the garlic/nut mixture in the bowl of a large food processor. Add ¼-cup oil and process until smooth. Continue adding oil until it is a smooth pesto-like consistency. Serve over cooked pasta topped with a bit of finely grated cheese. – All recipes courtesy of Marjory Sweet.